I recently carried out a survey of IT directors to gauge the level of interest in the sector in a "user group" to discuss Google Apps for Education or perhaps cloud computing more generally. There were 28 responses, which is quite a good sample size for something like this. As this seems to be something that people are generally keen on, I will aim to organize an initial meeting for Autumn 2010. Which of the following best describes Google Apps at your institution? So, half of the respondents either had a production service in place already, or were in the process of pulling one together. Incidentally, I'll blog separately about the work involved in getting our own Google Apps service up and running, and our students' data migrated. It's interesting to see that a third of respondents were considering their options or developing a business case at the time of the survey. What topics would be of particular interest to you? I had hoped that the responses to this question would help to shape the agenda for the user group meeting, and I wasn't disappointed. It was also good to hear from several institutions keen to share their Google Apps story with the community. I was hoping for more interest in Android and ChromeOS, for the reasons discussed in my blog post on chromoting - but this stuff may be best covered in an exhibition area with hands on demos. It was illuminating to see the level of interest in the Postini products - I had been wondering how visible these were to folk working in Education. Our own initial investigations suggested that Google may need to rethink their pricing model to develop an EDU market for these products. 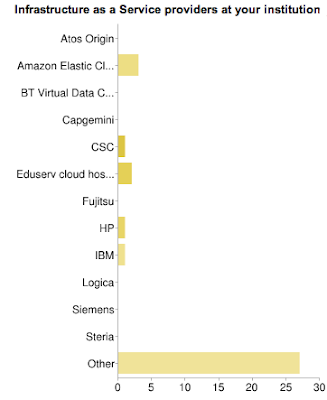 There are so many cloud hosted Software as a Service offerings that I decided to use the UCISA CIS survey system categories rather than attempt to list individual services. 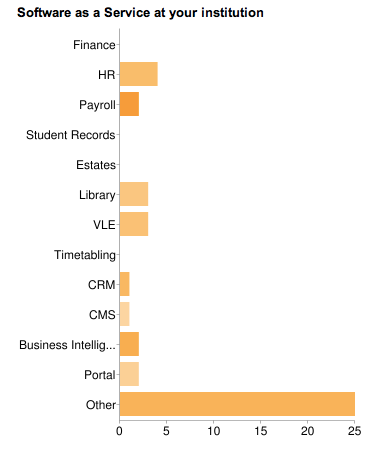 It was interesting to see that some HE institutions were actively pursuing SaaS solutions in areas that might be considered quite sensitive - such as HR and Payroll. From the long tail of "other" responses I picked up email and collaboration as the key additional areas. It may be interesting to consider whether the UCISA survey could usefully be extended to cover these and other infrastructure areas - e.g. preferred server, storage and networking vendors. 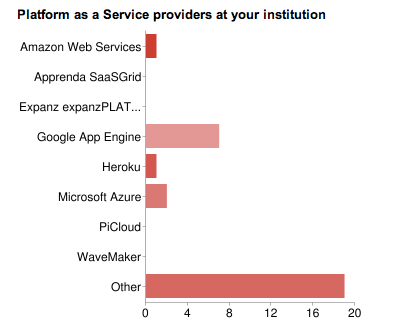 My feeling on drawing up the survey was that the only Platform as a Service providers in widespread use would turn out to be Google's own App Engine and Amazon Web Services. Hence I was pleasantly surprised to see that there was some interest in Heroku and Microsoft Windows Azure too. What the chart doesn't capture is that several of the institutions were looking into more than one PaaS provider. Institutions were also asked about their use of Infrastructure as a Service providers such as Amazon with their Elastic Compute Cloud (EC2) service. This is an area that has seen a great deal of activity in the last couple of years, with many of the traditional players banking on a move away from on-premise IT. It was interesting to see Eduserv's cloud hosting make an appearance. In this vein, Matt Johnson's blog posting on Eduserv's work on OpenStack and the "G-Cloud" is worth a look. Looking at the responses to these more generic cloud computing questions it seems to me that this is still an area where people are still feeling their way. This is in contrast to services like Google Apps and Microsoft Live@edu, which have already gained significant traction. A cynic might say that these two are special cases, because they are being made available at no cost to institutions for a variety of reasons. Indeed it is instructive to look at the potential costs of an EC2 hosted site as I have blogged about recently. there is a high 'Other' response to the final (IaaS) question - do you know what this represents? Ah, yes - the other answers were Servo and ULCC (from the same institution), but the "other" response mostly indicates that people didn't reply. With hindsight I should have had a "none" box for people to tick. Also note that "None" accounts for all of the "other" responses on the Platform as a Service section, so the only PaaS people were using were App Engine, AWS, Azure and Heroku. Martin - I don't know about your University but at mine we still have some staff who have difficulty with the desktop metaphor of today's GUI. I predict the shift to cloud based services such as Google apps where collaborative efforts can be real time and there is no concept of 'file --> save' for example will quite possibly cause some people difficulty. Have you got any thoughts / ideas on how to sell this new way to the somewhat reluctant?